Posted on Mon, Feb 20, 2012 : 4:30 p.m.
Editor's note: This story has been corrected to reflect the year Bill Clinton spoke at EMU. What do the the state's second-in-command and a nationally syndicated cartoonist have in common? They're both nominated to speak at Eastern Michigan University's spring commencement on April 29. The school's Board of Regents is set to vote to approve Dave Coverly, author of the cartoon "Speed Bump and EMU alumnus, and Brian Calley, lieutenant governor, as 2012 commencement speakers. While a student studying philosophy and imaginative writing at EMU in the mid-1980s, Coverly ran a comic strip in the Eastern Echo. Three decades later, the Ann Arborite's cartoons have appeared in 200 papers nationwide, including the New York Times and The New Yorker. 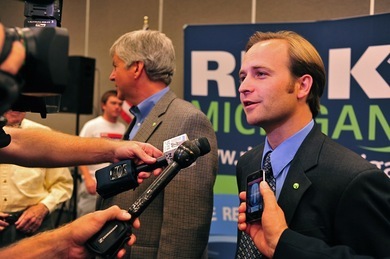 Calley spent years as a banker before becoming a state representative and is the second-youngest lieutenant governor in state history. EMU plans to award Coverly and Calley honorary doctorates in fine arts and public service, respectively. Last year EMU alums Robert Skandalaris, owner of Quantum Ventures of Michigan LLC, and Steven Tapper, partner and vice president of Tapper's Diamonds and Fine Jewelry, were the school's commencement speakers. Former President Bill Clinton, likely EMU's most notable commencement speaker in recent history, was in his final year of office when he spoke during the school's 2000 graduation. Wed, Feb 22, 2012 : 4:25 a.m.
What o they have in common? Why thy both author jokes, of course. What else? One of cartoons and one of legislative proposals with the Governor for the joke of a legislature to consider. Tue, Feb 21, 2012 : 2:24 a.m.
As a prominent EMU alumnus, class of 1988, I was hoiping the school would invite my homey Kwame Kilpatrick back. Tue, Feb 21, 2012 : 2:25 a.m. Sorry, I did not do well in Spelling while I was there. Mon, Feb 20, 2012 : 11:24 p.m.
ann arbor.com...um Clinton spoke in his final year of office of what exactly in 2010? Mon, Feb 20, 2012 : 11:45 p.m. Thanks for catching that error. The story has been updated. Mon, Feb 20, 2012 : 11:22 p.m.
Mon, Feb 20, 2012 : 10:11 p.m. I didn't know he was a banker explains it all now.